CROSS PLANES: Cryptogram: Sharknado for the Cypher System or Oh Hell No! Cryptogram: Sharknado for the Cypher System or Oh Hell No! 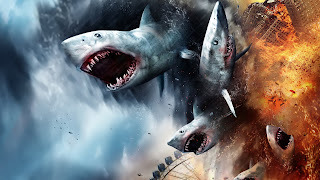 Modifications: Chainsaws are an asset that reduce the difficulty by 2 against Sharknados and everyone is Specialized with Chainsaws (inflict 6 damage) when a sharknado strikes. Use: A good laugh? A chance to kill celebrities? Make your kids squeal? Loot: A dead sharknado is its own reward. *My kids love these movies. This one's for M and E.